Get time back in your day. Let us come to you. There is no extra charge for our pick-up and delivery service. Prices are the same as store prices. We’ll help you designate a weather-safe area to leave your garments. Call 404-892-1997 to learn more or send an inquiry to have someone contact you. Bi-weekly service will be either Monday/Thursday or Tuesday/Friday based on your location. You don’t have to be home. 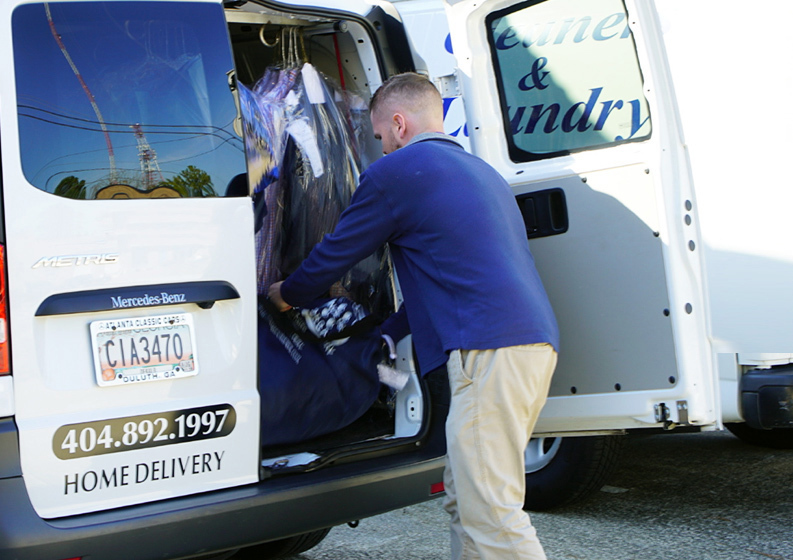 A uniformed driver in a company branded truck will pick up your dirty garments and leave your clean garments. It is so easy you will wonder why you hadn’t signed up sooner! Our route service covers all of Metro Atlanta. Please fill out the form below and we will contact you to complete the sign-up process. As a family business, we’re proud of all the relationships we’ve formed through the years with our customers. We’re professional and accountable for every single item you hand over to us.